Furniture lovers who like a modern take on the classic Mission design will love the Custer Eight Door Hutch. Also, upscale homeowners seeking for a large, grand, solid hardwood hutch will want to consider this piece as well. So let’s delve into Mission Meets Modern: The Custer Eight Door Hutch. 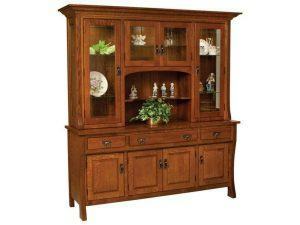 A spacious, elegant design marks the Custer Eight Door Hutch. Skilled Amish cabinetmakers custom-craft each Custer Eight Door Hutch. And the Amish men use solid regional hardwoods like oak, maple, cherry and hickory. Also, the builders draw from skills handed down from their ancestors. That’s why each hutch is incredibly well built. Homeowners will notice a range of high-end features. All four drawers open full extension. This gives everyone easy access to every corner of each drawer – even to items at the very back. Also, dovetail drawer joints enhance strength and durability. What’s more, the five glass shelves are adjustable. So homeowners have flexibility in arranging items on the shelves. And plate grooves in the glass make it easy to show off fancy plates. On a practical note, the Custer Eight Door Hutch comes with four wood and four beveled glass doors. Also, a fixed shelf in the base enhances storage potential. You can see the Custer Eight Door Hutch, as well as many other hutches at Brandenberry Amish Furniture’s online catalog. Or visit their ‘brick and mortar’ store in Shisphewana, Indiana. And you’ll find out first-hand how Mission Meets Modern: The Custer Eight Door Hutch.